There is a cool and crisp feeling to the air and a tinge of autumn color in the leaves. I identify with Chicken Little during my daily walks, as falling acorns barely miss my head. Fall is here! 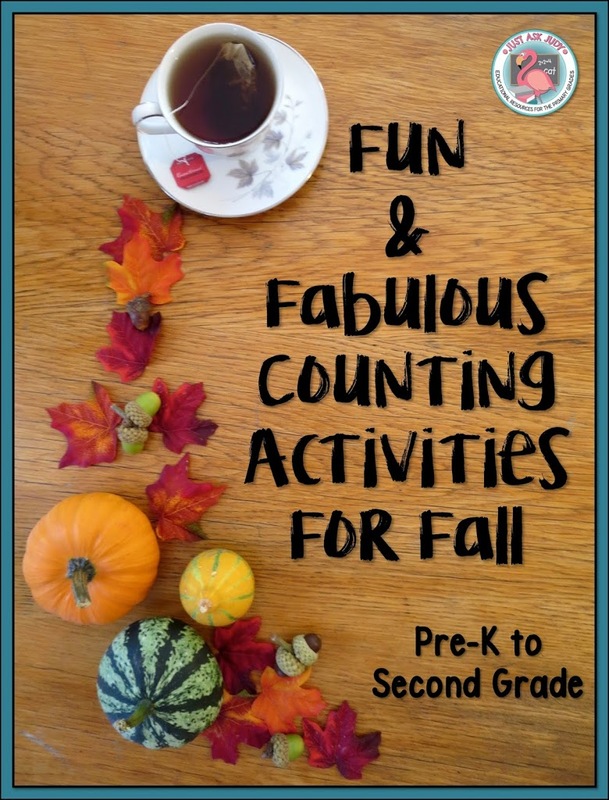 I have collected many fall “treasures” over the years to engage my kindergarten through second grade students in a variety of counting activities. Somehow, even though I’ve retire from full-time teaching, I’m still collecting “treasures”! I love all the symbols of fall, seasonal and holiday; apples, pumpkins, acorns, leaves, bats, spiders, footballs, turkeys, jack-o-lanterns, ghosts, and more. I have acrylic fillers, gems, erasers, pompoms, buttons, beads, and edibles. This activity is appropriate for children who need experiences with accurately saying one number word for each object and with cardinality. Use a set of objects that can be sorted by color, size, or kind. A sorting mat is optional. This is a great activity to use in tutoring, intervention, or resource settings, as well as an independent math station. Use one or two quantities your students can easily count along with one or two quantities within their zone of proximal development. You can put sets in baggies for convenience. Have your students sort by attributes, then count each group. If appropriate, they can also record the written numeral. Extend it further with number words, tallies, and ten frames. Vocabulary for comparing quantities can also be applied. Counting cups actively engage your students as they work on number recognition, counting, and cardinality to 20. They simply count a quantity to match the given number and place it in the cup. The cups may also be sequenced from least to greatest and greatest to least. I discovered the ghost cups in a grocery store. I wrote numbers on them with a permanent marker. You could easily draw a ghost face on plain white cups. White pompoms or ghost buttons make perfect counters. I spotted the orange plastic cups half an aisle away (also, at the grocery store) and in my mind’s eye instantly transformed them into pumpkins! You can download the free pumpkin stem and leaf number cards for 0-20. There is a bit of cutting involved. The black and white version can be printed on colored card stock or hand colored. Use adhesive dots to attach them to 18 ounce cups. Of course, you could simply write numbers on orange cups and be done! 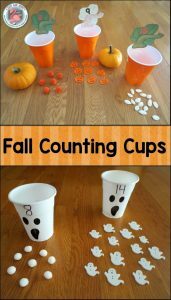 Use pumpkin seeds, pompoms, or buttons for counters. Select a range of numbers or specific numbers. Keep in mind that 55 counters are needed to fill cups 0-10 and an additional 155 to fill cups 11-20. Counting by fives and tens is a rather abstract concept that children memorize, sometimes easily, sometimes by practicing the patterns on a hundred chart. 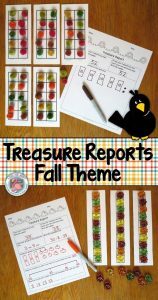 These treasure reports for kindergarten and first grade, available as a free download in my Teachers Pay Teachers store, help to develop an understanding of this concept by grouping and counting sets of objects by tens or by fives. Each student or pair of students needs a set of objects that are an exact quantity for counting by tens or fives (ex. 70 or 55). The recording sheets have a seasonal border. The use of five frames, ten frames, or ten strips is optional. I have also used small paper plates and cupcake liners as organizers. I like to repeat this activity several times over a period of time with different objects. It can be completed with a whole class as a demonstration with students taking turns or with partners, as an independent station, or in an intervention or resource setting. Treasure reports are also a fabulous activity for developing conceptual understanding of place value in first and second grade. Students need a set of objects, 11-99. This time, they are grouped by tens with extra ones. I have my students count the collections by ones first, which can be a challenging task for some students. It also seems straightforward that a set of counters will contain the same quantity whether it’s counted by ones or grouped and counted by tens and ones. Yet, there are some children who don’t grasp this immediately. There are five different recording sheets included which cover grouping and counting, base ten, expanded form, rounding to the nearest ten, and counting by tens off a decade number. 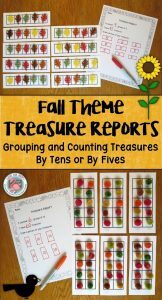 You can download this free fall themed treasure report resource for tens and ones in my Teachers Pay Teachers store. 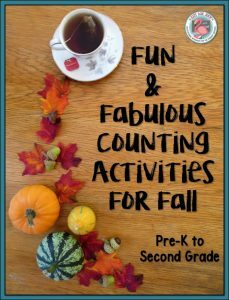 I’d love to hear about your favorite counting activity or seasonal treasure. Browse my Teachers Pay Teachers store and Pinterest boards for more counting and place value activities.